Frying oil --- 1-1/2 qt. Lettuce cups --- 4 ea. In a deep fryer, heat oil to 360ºF. Mix mayonnaise with TABASCO® SWEET & Spicy and Original Red Sauces; set aside. Dredge shrimp in cornstarch and deep-fry until shrimp are slightly brown. Remove to drain on a paper towel. Toss cooked shrimp with mayonnaise mixture; coat evenly. 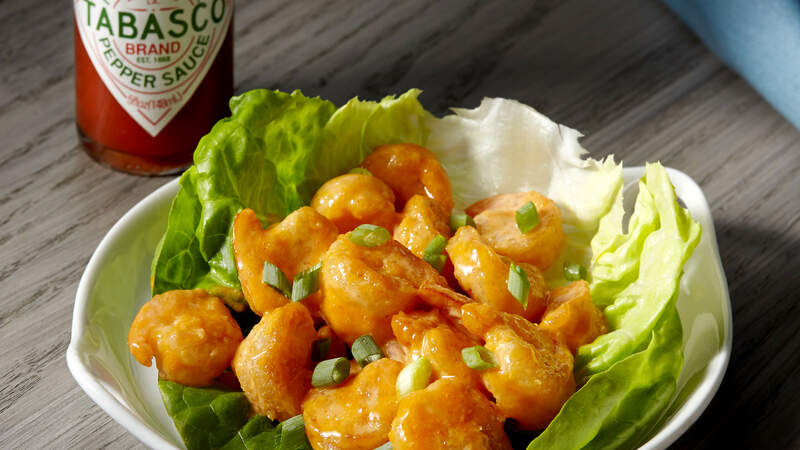 For each serving, place one-quarter of the shrimp in a lettuce cup. Garnish with chopped green onions, season with salt and pepper, and serve.